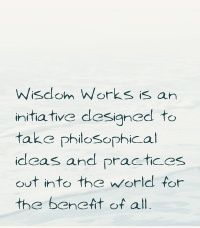 I would like to welcome you to Wisdom Works and to tell you a little about the project. As the name suggests, Wisdom Works has arisen in the belief that there is a continual need for wisdom, and that great ideas have the power to change things for the better; they have the power to grant us all insight and understanding. There is a weekly newsletter, distributed via email. There is a reflection, based upon a series of related themes and, arising from them we run courses of various kinds. living beyond self imposed limits, discovering the power of the present, revitalising your experience of life, awakening to the need, deepening your relationships and learning to live life to the full. Together with the reflection, each newsletter has a practical exercise to support the idea being explored. Supporting the venture as a whole is the fundamental exercise of Self Remembering. If you would like to gain a fuller idea of the breadth of the themes currently being explored you can find them in Philosophy Works published by Watkins Press. The whole point of this initiative is to encourage new ways of thinking, thinking that will add to the general stock of wisdom for the betterment of all. If, after having received these emails, you feel that you have something to offer in some way to this whole process, you may do this is in different ways. The most obvious and immediate way is to email onto friends the reflections that you receive. You might want to encourage others to join Wisdom Works, you can easily do this using the 'Pass it on' box on left hand side of this page. Some have gone further and developed their own informal circles based on these emails, and you might want to do the same. What has also happened is that people have recognised specific ways in which Wisdom Works could help society. To assist them with this we are gathering a team of people to create interesting ways of encouraging the spread of wisdom. We are exploring new ideas all the time, and if you would like to make a contribution to this process please let us know. What is also extremely useful is for people to tell us what is happening in their own lives. People's own stories of personal transformation are most inspiring. Let me stress that this is a completely free offering for you to use in any way that suits you. I only ask that you aid the whole process of spreading wisdom by keeping in touch both with others and with us.